Packing for a trip that is 103 days long is quite an undertaking especially when you take into account that the temperature range on our trip will be a low of 32 and a high of 100 degrees. Add to that the fact that each of us has just 22-1/2 inches of hanging space in our cabin closet. And then there is the weight and size restrictions the airlines have set on all checked luggage. Plus we have to store our suitcases under our beds in the cabin (no trunk storage room) and the clearance under the bed is just 11-3/4 inches, so some suitcases did not make the team. Each requirement has been a challenge, but we think we have it somewhat under control. I did a practice run, packing as much stuff as I could in my large suitcase and then did an analysis of what was left over for the second suitcase. 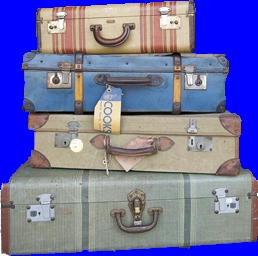 Luggage Concierge Service up in New York is going to handle our luggage transfers. We shall each ship 2 suitcases via UPS ground a week ahead of time. The luggage service will then take the bags from UPS and store them until the day we sail and deliver them to the ship for us. Cunard will place them in our cabins, so even if we miss the ship because of bad weather getting to New York City, our luggage will enjoy a leisurely trip with out us down to Fort Lauderdale where we will have another chance to catch up with the ship.